I am a Christian because of Bill Watterson. As a kid, there are few books my parents could’ve given me that would have brought more long-term benefit to my soul than Calvin and Hobbes. Yes, yes, yes they had me read the Bible and, of course, that was the best thing for me. But, to be frank, my Biblical explorations as a wee-lad consisted less of a deep spiritual connection and more of perusing the Song of Solomon for, shall we say, an illustrative phrase or two. While I highly value the Biblical background in which I was raised, I also strayed from that in various fits of rebellion and self-exploration; though the Bible was consistent, I was the boat tossed in the waves of doubt and wanderings. Yet even in these times, Watterson’s writings remained a persistent part of my life, like a life jacket tucked under the seat in my wayward heart. 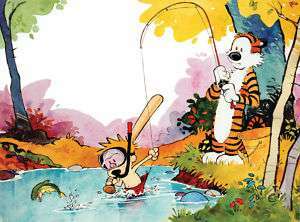 In what I can only assume was an unintentional manner, Bill Watterson created a small safety net for me, a corner of the imagination which would ensure I’d never really stray from God and he did so in the character of Hobbes. Calvin and Hobbes is a comic strip syndicated from November of 1985 until December 31, 1995 crafted at the hand of Bill Watterson, an aspiring journalist from northeastern Ohio. The comic depicts the imagination, lessons, antics and musings of 6-year-old Calvin through interactions with the normal entourage of a child’s life: the despicable, cootie-ridden female Susie Derkins, his eternal struggles against his school teacher and heinously evil baby-sitter Roslyn, and his grandiose adventures in everything from time travel to attacks from deranged snowmen, all with the faithful companionship of his stuffed tiger Hobbes. The series is full of philosophical allusions: it is strongly believed that Calvin is named after John Calvin, and Hobbes inherited his title from 17th century English thinker Thomas Hobbes. Even the teacher in the series, despised and demonized Miss Wormwood, is speculated to have received her name from C.S. Lewis’ character in the Screwtape Letters. With Bill Watterson’s decision to stop writing, however, came the fruition of his reclusive lifestyle and Watterson himself has never confirmed these notions. Throughout the strip’s tenure the character of Hobbes frequently plays the foil to many of Calvin’s antics. 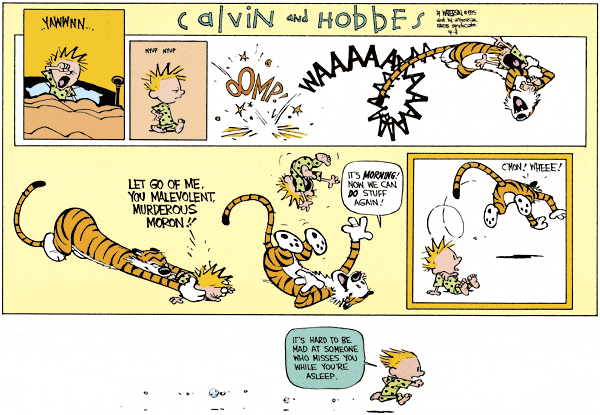 While he follows Calvin’s lead in just about every activity, whether it be a plot to water-balloon Susie or an attempt to avoid cleaning up his room, Hobbes is frequently found exposing Calvin’s particularly selfish notions, pointing out his illogical claims or simply antagonizing his ego. The result is an ongoing struggle between the two which is constantly juxtaposed to Calvin’s struggle with everyone else. The difference in the two struggles is apparent; despite any differences between him and his tiger, it’s remarkably clear that Calvin can always count on Hobbes to be waiting for him after a long day at school or there in his bed each night. The relationship they have is one that Calvin cherishes even in the worst of moments. The funny thing about Hobbes is that he doesn’t decrease conflict in Calvin’s life, if anything, he actually prompts more of it. Whether he straight up opposes Calvin, or simply doesn’t join him in every whim of Calvin’s ego and will, Hobbes is perpetually finding ways to get under Calvin’s skin. But the logical “grown up” reader will look at most of Hobbes’ conflicts with the protagonist and realize that Hobbes (usually) represents a far more logical, mature and peaceful reconciliatory solution than any of Calvin’s egotistical ones. The irony here is, of course, that to a real “grown up” Hobbes does not exist. And there is great significance in the discussion over the reality of Hobbes’ character. To Calvin’s parents, Hobbes is just another stuffed toy, admittedly one that to which their son is incredibly attached. 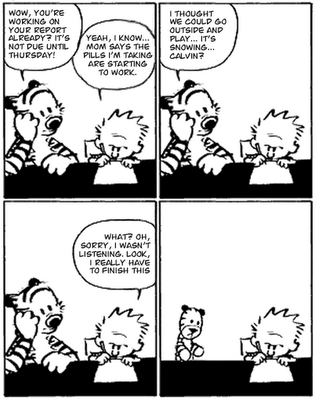 But Watterson repeatedly shatters the accusation that Hobbes is just a figment of Calvin’s imagination. In doing so, he reveals to us that the foolishness of adults in the comic strip, those who are “wise in the world”. 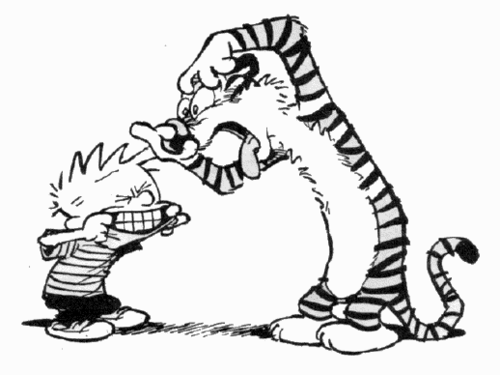 There is nothing malicious in Watterson’s critique of grown-ups, if anything we are tempted to side with them. They are sympathetic, imperfect, lovable and entirely quirky characters. But despite all their positive traits, they cannot see the obvious: that Hobbes is as real as they are. And at the end of the day readers are forced to accept that we cannot separate the character of Calvin from Hobbes, just like you could not separate Christ from the Christian, even though their identities are separate and their wills distinct and to the outside eye. 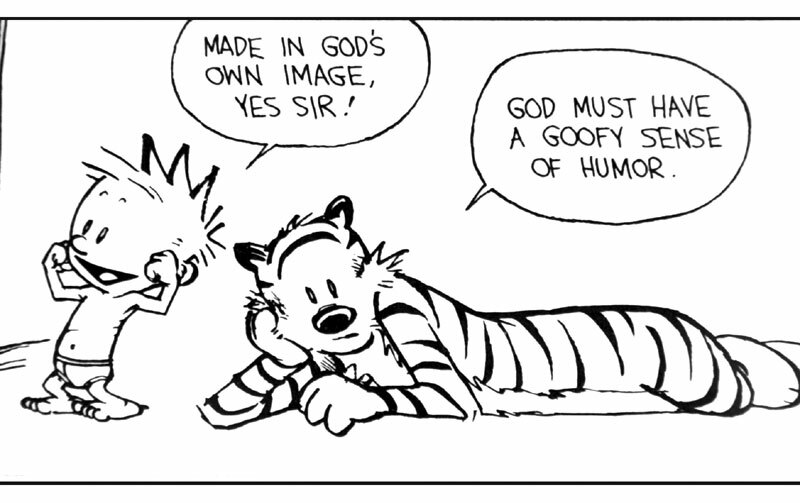 I don’t believe Watterson intended for Hobbes to be a God figure. Such a statement has no concrete evidence, and has many holes in the theory at best. For me to claim Watterson’s intent, or base any theory on my perception of the strip, would subject Watterson’s work to my personal thoughts and whims (an act I’m against on principle). 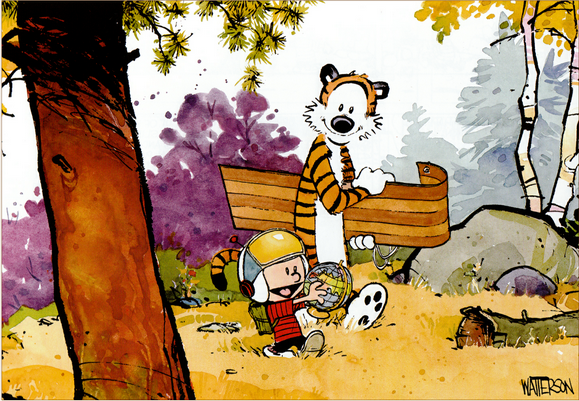 What I am proposing, however, is that Watterson did attempt to depict an undying, imperfect, fluctuating, exciting, hilarious, riveting, heartbreaking, and innocent relationship between a boy and his stuffed tiger, a being who was something much greater than a figment of Calvin’s imagination. This relationship is one that is attempted in various forms of literature. It’s found throughout history in stories and tales that each make an attempt to capture the love and loyalty that is only accessible through imagination and an apt child-like faith. 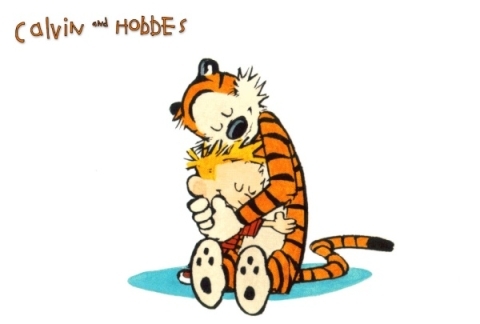 The existence of this relationship between Hobbes and Calvin can be strongly supported from many different examples in the comic strip. In depicting this, however, Watterson (albeit unintentionally) stepped out of the secular world and into the divine, thus finding that the veil separating them was never too thick to begin with. 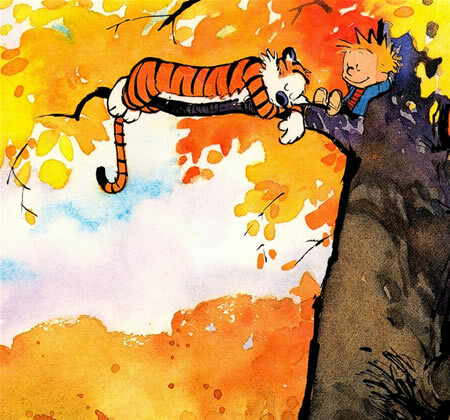 In creating the relationship between Calvin and Hobbes, Watterson inevitably found himself illustrating aspects of companionship, adventure and loyalty that we all seek and yearn for, the type that we can only truly find in God. Only a perfectly loyal God will be as faithful as Hobbes while only a perfectly just God will simultaneously antagonize our most selfish and egotistical desires. Only a perfectly humble God can enter into our world and only a perfectly beautiful God can meet us through the imaginative mind, which appears so ridiculous to everyone else. Only a perfectly loving God could possibly take the time to be with us during every major life event, to join us in our silly games (called careers), put up with our selfish antics (called aspirations) and to accompany us to the Yukon Ho and back. 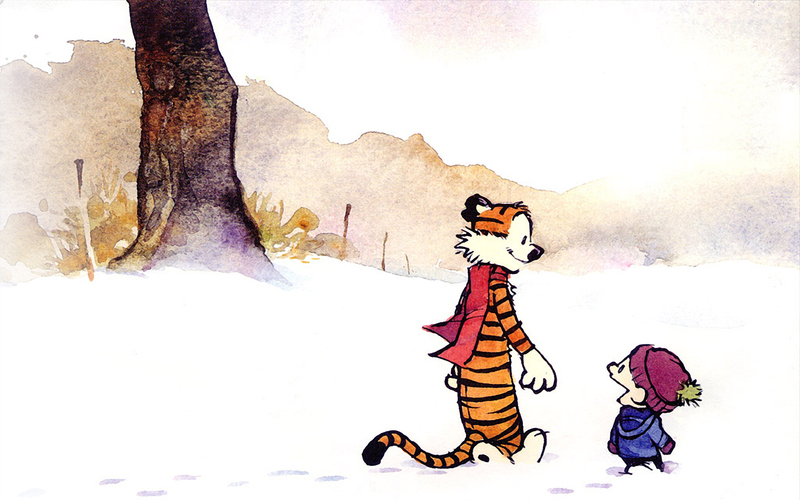 Watterson did not intend to, but like a brave adventurer will one day wander from the plan he had devised and off the charts he carried with him, Watterson’s imagination took him down a road it was impossible for him not to follow. Artwork, in whatever form, cannot attempt to depict characteristics of the Divine without being absorbed into it. The early death of the comic strip begs the question: what would have happened when Calvin grew up? I shudder at the mere mention of it. A comic strip with a teenage or even adult Calvin, laughing at the childish days is despicable and painful to any loyal reader. Like much of the strip, there’s something deeply theological about that. 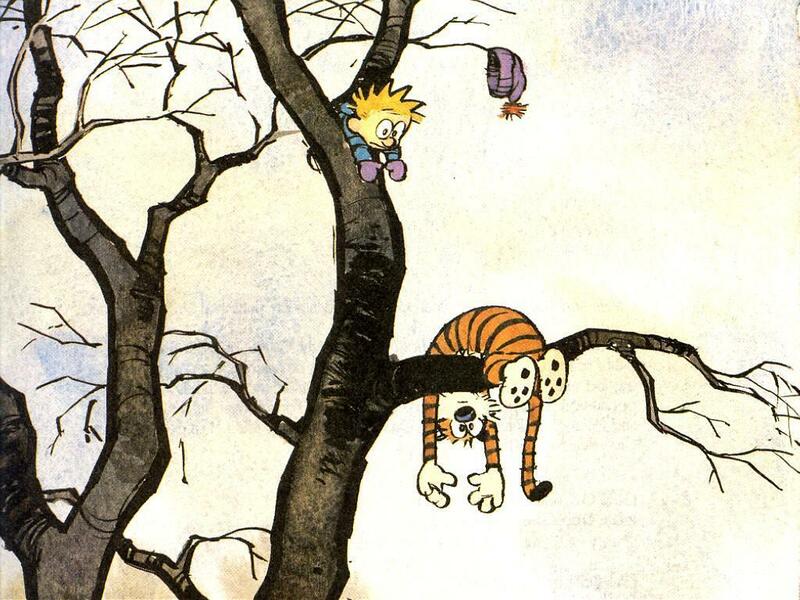 One of many knock-off comic strips, speculating the future of the relationship between Calvin and his stuffed Tiger. Because we are called to have the faith of a child. We are called to have a faith in which the world ends with our backyards, war is just a game men play and the deepest conundrums involve a girl down the street or a teacher armed with homework. We are not called to know everything but to humbly accept the alternative and admit that we don’t. We are not called to solve the world’s problems, but to revel in the mystery and adventure of the world around us, to stop playing the role of savior and start playing the role of a captivated youth. We are not called to be perfect, we are called to be children, children who imperfectly love our most loyal and perfect companion, despite the fact that His nature sometimes annoys our own flawed one and no one else thinks He exists. The early disappearance of Calvin from the world of comic strips meant that Calvin will always be a child. He will always be a little punk of a six-year-old who hates school, finds the girl next door to be cootilicous, is the sworn enemy of his teacher and babysitter and, in his worst moments, gives his parents grey hair. But on the other side of the coin, his eternal childhood preserves with him the relationship he has with Hobbes; the relationship in which Calvin’s worst side is constantly antagonized, while every positive attribute is brought to light for the world to see and take delight. Watterson may not have intended it, but with the character of Hobbes he has given us a small, minuet, fuzzy-brained picture of our eternal relationship with Christ, as foolish to the world and antagonizing to our own egos as it often may be. Theology is important, but intellect is fleeting. My job, my hopes, my plans, they’re all aspects that are constantly diverted by One who knows much better than I. And yes, I want to change the world for the better; I want to see God’s kingdom come. But beyond all this, I just want to know God. Not comprehend, but know, know him like an old friend, a life-long companion. Bill Watterson is one of many artists whose work has made this a little more possible. This is why I make a point, at least once a week, to put aside my theology, my Greek and yes, even my Bible, and dive into the world of Calvin and Hobbes. For me, it’s just another way of connecting with my Hobbes. 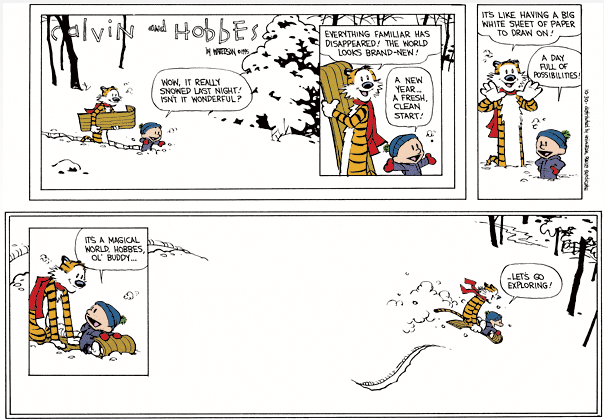 Where does Calvin and Hobbes get its name? Anyone who can combine theology and Calvin & Hobbes gets a thumbs-up from me! I LOVED this one. Needless to say I can really relate!! You express thoughts so clearly that I never could. Excellent stuff. Have you ever heard of Mars Hill Review? It rings a bell but I can’t say I’m totally familiar with it…why do you ask? Brilliant, Bryn, just brilliant. I’m not sure which impresses me more, your thoughts, or the way your write them. Thanks, I appreciate the compliments and your readership. I hope you continue to get something out of my posts! havge any ideas or tips for new blog owners please share.